One of Northern Ireland's leading liver consultants has voiced concern about the growing number of women dying from alcohol-related diseases. Dr Roger McCorry leads the Belfast Trust's Alcohol Care Team. He said the number of number of young women he is seeing with advanced liver disease was "tragic". 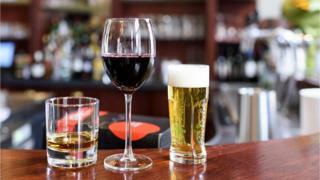 The overall number of deaths attributed to alcohol in Northern Ireland has reached record levels. There were 303 alcohol-related fatalities in 2017, almost 30% more than a decade ago. Men still account for the majority, but there is growing concern about the number of deaths among women. In an interview with BBC News NI, Dr McCorry said: "I think the figures are a real reflection of what we're seeing on the ground. "Unfortunately as a clinician who looks after patients with alcohol-related liver disease, we're seeing younger patients presenting with very advanced liver disease and in many cases dying as a consequence of that." He added: "Increasingly it would tend to be younger women in particular which is obviously very tragic." The latest figures on alcohol-related deaths were published by the Northern Ireland Statistics and Research Agency (NISRA). Northern Ireland coroner Joe McCrisken has previously spoken out about the rate of alcohol and drug related deaths in Northern Ireland. From 2007 to 2017 there were over 1,500 more alcohol related-deaths (2,761) in Northern Ireland than deaths connected to drugs (1,195). "Alcohol led me down a dark path, mentally and physically, at one stage I was down to five stone. "I was a sad lonely lost young girl and alcohol took me away from everything I love. If I had kept going like that I wouldn't be alive today." Nuala eventually enrolled in a 20-week programme with Cuan Mhuire, the rehabilitation centres which helps people caught up in addiction. She's now been sober eight years and is training as a counsellor. "I'm still learning to enjoy life without needing a substance, but it's not easy, you have to take it one day at a time. "Everywhere you look there's a reminder of alcohol, whether that's on TV or when you walk into a shop, it's so commercialised." She added: "Many people can have a drink and leave it at that, but there are those of us who take a drink and can't put it down." Dr McCorry said there is a misconception around what the general public expect the profile of an alcoholic to be. "This idea of the older man, often isolated, drinking to levels of physical dependence isn't always the case," he said. "I'm seeing much younger patients who have a drink on a daily basis, they may be highly functioning, they may well work, they are often parents of young children." He added: "On the surface there may not be any signs that they have an alcohol problem, but they are still drinking well above the recommended guidelines and potentially contributing to alcohol-related harm." In May 2018 a law came into force in Scotland that set a minimum price for drinks depending on how many units of alcohol they contained. But the collapse of the Assembly in January 2017 has hampered attempts to have similar legislation being introduced in Northern Ireland. Dr McCorry said much could be learnt from the Scottish example. He said: "Alcohol is more accessible than ever here and I believe minimum pricing would have a huge impact from a public health perspective. "But with the absence of legislators at Stormont, unfortunately progress with that has completely stalled." Dr McCorry said he is worried that the message about the dangers of alcohol isn't getting through to the general public. He said: "There is no issue in looking forward to a drink of an evening, but when you step back and think that you are looking forward to a drink every single day of the week that for me is a worrying sign. "Perhaps you're at a point then when you need to reflect on the amount you're drinking and seek support for that or take action."